Combine the control, security, and performance of private cloud solutions with the flexibility, economics, and speed that public clouds can offer. With our Cisco cloud portfolio, you can build complete and hybrid-ready private cloud solutions while retaining visibility and control over your IT environment. Our market-leading UCS Integrated Infrastructure provides a proven, fabric-based platform designed for highly efficient and automated cloud deployments. To help you accelerate the delivery of IT services, our private cloud solutions have been built on validated designs in conjunction with a number of infrastructure and application partners such as NetApp, VCE, EMC, VMware, Microsoft, RedHat, and SAP, and include both fully-managed and self-managed OpenStack-based implementations. With Cisco Application Centric Infrastructure (ACI) you can promote consistency of policies for on-premises and private cloud applications, making them easier to manage, deploy, and migrate. 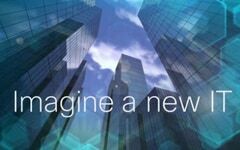 Manage and gradually automate your infrastructure, clouds, and application lifecycles with the Cisco ONE Enterprise Cloud Suite.This engineered solution helps you automate and deliver cloud-based services faster and more easily through a continuum of building blocks ranging from bare-metal to hybrid cloud management. Cisco Intelligent Automation for Cloud provides a comprehensive custom cloud management solution for enterprise customers. With out-of-the-box network, Software-as-a-Service (SaaS), Platform-as-a-Service (PaaS), and Infrastructure-as-a-Service (IaaS) automation, this solution is designed for heterogeneous cloud environments. We deliver, along with our partner ecosystem, hybrid-ready private clouds that facilitate portability of workloads across the entire Intercloud, without compromising your availability, security, or performance requirements. When you’re ready to extend your private cloud with Cisco Intercloud Fabric, you can create an open, transparent, and highly secure hybrid cloud environment across multiple cloud providers and between your premises-based applications and the public cloud. Retain complete control with our hybrid cloud orchestration and management framework. Help ensure consistency of network and security policies. With Cisco, you can diversify your hybrid cloud sourcing strategies. Choose from over 200 Cisco partners that deliver hundreds of Cisco Powered cloud and managed services. Start reaping the benefits of your cloud initiative faster. Cisco Cloud Consulting and Managed Services, available from expert Cisco consultants and channel partners, guide you in assessing opportunities and developing and implementing your unique cloud strategy and plan. Fuel your competitive advantage by including new business models, new market opportunities, and the capability to monetize your business assets, all while reducing your total cost of ownership. Cisco makes cloud simple! It’s a necessary journey.